Angelo, My family has returned home to New York and California. I want to thank you from the bottom of my heart. What you did for us made our our Italian holiday wonderful. You found my family in Naples. We will always keep in touch with them and they loved seeing their relatives from the USA for the first time. You are now an adopted Fornaro family member. Our three days visiting --------Naples and Amalfi coast with you was terrific.Please stay in touch with us and when you come to New York call or write to me. I will never forget the service you provided us .You showed us the best sites of Naples/Amalfi and Capri and everyone loved your kindness and knowledge of the area. di Sorrento e de la Costa Amalfitana e de tutta la vostra gentilessa. Cesare Augusto in torno del 10 de maio.Il contato ce stato Amedeo. Aspetiamo que sia benne e con molto laboro. I hope you can remember us. You kindly drove us to and from the airport to the Rota suites in mid July. On the journey back to the airport we had to leave early because an unexploded bomb was found near to the main road. 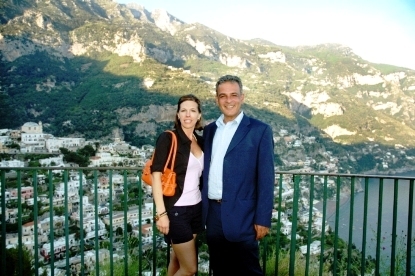 Your business is first class and we will telling our friends to contact you when they visit Sorrento. We will also be returning to Sorrento soon as it is such a beautiful place. Good luck and maybe we will see you soon. Hartley & Sue Osborne - Truro, England. You are not going to believe this, but I just sat down at my computer to send you an email and There was your email to me!!! Didn’t send it to Bulgaria until after we left! Amazing though, it arrived in Florida 3 days after we returned home. You did to make us feel at home there with the short time we had. Merry Christmas and All the Best to you and your family in the New Year! Just Cruises and Tours, Inc. This is who did a great job and was more than helpful. She speaks English, German, and I believe French in addition to Italian. 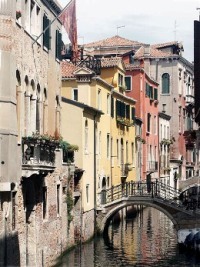 She may do other than Venice, since she is a licensed guide. Angelo was our driver for the coast and other village trip. As, I mentioned, he picked us up at the hotel and dropped us off there after. He also does Pompeii, Naples, and other areas -- you would have to ask him what-all. If I didn't mention it, The person, Iris, who was our guide in Capri, was unbelievable also. Then, the person in Pompeii, Roberto, was great. In addition the driver who picked us up at the airport and the driver who took us to Pompei also drove us to Naples to the train, were great. The trains took a little getting used to -- getting papers stamped and the right information on them, but the conductors were OK as well as one inspector. One more thing that I can't help but tell you. If you want to recommend a great Restaurant in Rome that is really Italian from beginning to end, it is Restaurant Roberto located on Pio Borgo. Good food and reasonable by Rome standards. It is in the Vatican area. Taxi reasonable to get there. Be sure to ask for Claudio (pronounced Cloudio). Here too, tell them Frank sent them. Ha, ha, he, he. Again, we all had a fine time. We had a very nice time with you in Italy. We will never forget how nice you were to us and the great time we had. I wanted to write to you and send a picture, but I made a mistake. Here is a photo of you and us that your friend took. 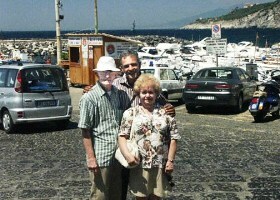 I am the person that you picked up in Sorrento for the Amalfi Coast tour. I sent a mail to you by mistake. The letter was supposed to go to a travel person who I asked to contact you so she could contact you for some trips in Italy. I'm sorry it got to you by mistake. Please let me know if you get this mail and if you got the one by mistake. Merry Christmas and a Happy New Year from John and Margaret. See you next year. Hope everyone is well. Give our love to everyone. Just wanted to thank you again for everthing you did for my daughter, Michele and myself. You are a great guide. I would certainly recommend you to my friends. You are very knowledgeable about the area and the drive was a real pleasure for us both. You made my stay in Italy, especailly in Villamaina, a trip of a life time. By the way, how is the Salami from my cousin Pietro? I want to thank you very much for the wonderful driving! Laura and I enjoyed all your knowledge and stops you made for us. It is hard to believe that we are back to reality in the States. We can not wait to return to Sorrento and Positano and you will be our first contact for driving when we get back to the area.